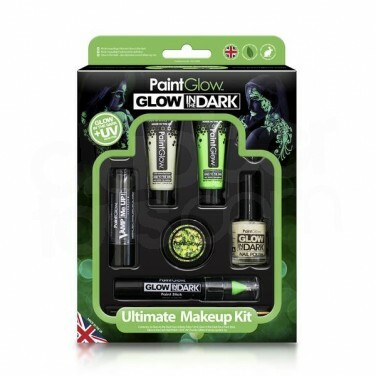 All you need to style out a party look like no other, the Glow in the Dark Ultimate Make Up Kit will have you glowing in no time! 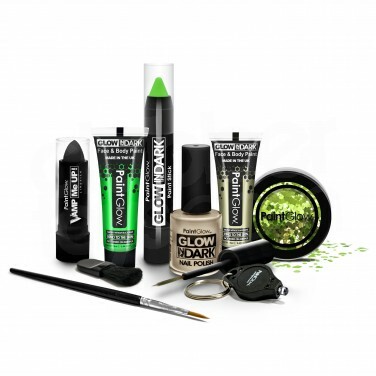 Each kit contains two glow in the dark face and body paints (one green, one natural glow), one glow nail polish, one green glow in the dark face paint stick, one black vamp lipstick and a pot of chunky body glitter so that you've got everything you need to create dramatic looks that glow in the dark! 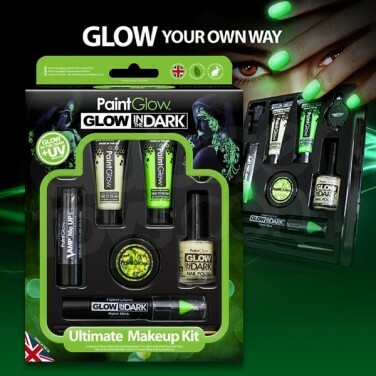 Simply allow the body paints to charge in light before viewing in pitch black conditions for best glow in the dark effects, or wear them under UV blacklight for a beautiful vibrant glow! 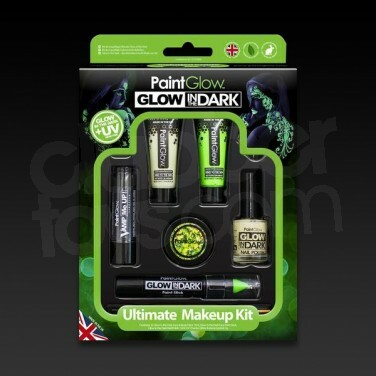 Kit contains 2 x 13ml glow in the dark face and body paint (1 x green, 1 x natural glow), 1 x nail polish 12ml, 1 x green glow in the dark face paint stick, 1 x chunky glitter pot (green), 1 x 5g Vamp lipstick (black), 1 x mini applicator brush, 1 x paint brush and 1 x mini UV keyring torch to super charge!